Manitoba is one of Canada's 10 provinces; it is the easternmost of the three Prairie Provinces. Initially dominated by the fur trade, which discouraged settlement, today agriculture is most vital to Manitoba's economy. 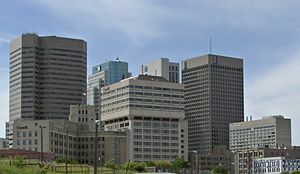 Its capital and largest city, with more than one half the province's population, is Winnipeg. It is known that there are several possible sources for the name "Manitoba." Some believe it comes from Cree or Ojibwe languages and means "strait of the Manitou (spirit)." It may also be from the Assiniboine language for "Lake of the Prairie." The Manitoba Act of 1870 provided for the admission of Manitoba as Canada's fifth province. The Act was adopted by the Canadian Parliament in response to concerns of the Métis people. Descendants of Native peoples and French fur trappers, the Metis were the majority population at the time of the province's founding. Reflecting the settlement's cultural diversity, a popularly elected convention supported a provisional government led by Louis Riel. Riel was a major influence to the Manitoba Act's passing. In 1992, Canada officially acknowledged him as the founder of Manitoba province. Churchill, on Hudson Bay, is the only Canadian Arctic Sea deep water port. The seaport serves as a primary link along the shortest shipping route between North America, Europe, and Asia. Manitoba is one of Canada's most ethnically diverse provinces. Among its population are more than 115,000 people of aboriginal ancestry. Manitoba is also home to the largest community of Icelandic origins. Large numbers of descendants from Russian, Polish, Estonian, Scandinavian, and Hungarian immigrants reside in the province. Broadening its diversity further, numbers of Asians, Latin Americans, and Arabs have emigrated to Manitoba in recent years. 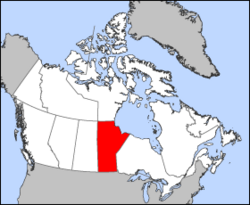 Manitoba is located in the longitudinal center of Canada, although it is considered part of Western Canada. It borders Saskatchewan to the west, Ontario to the east, Nunavut and the Hudson Bay to the north, and the American states of North Dakota and Minnesota to the south. In addition to the capital, Winnipeg, other cities with more than 10,000 people are Brandon, Thompson, Portage la Prairie, and Steinbach. The province has a coast along Hudson Bay and contains the tenth-largest fresh water lake in the world, Lake Winnipeg, along with two other very large lakes, Lake Manitoba and Lake Winnipegosis, and thousands of smaller lakes. Manitoba's lakes cover approximately 14.5 percent, or 94,241 km², of its surface area. Lake Winnipeg is the largest lake within the borders of southern Canada and one of the last remote lake areas with intact watersheds left in the world. Large rivers that flow into the east side of Lake Winnipeg's basin are pristine, since no major developments are situated along them. Many islands can be found along the eastern shore. Important watercourses include the Red, Assiniboine, Nelson, Winnipeg, Hayes, Whiteshell, and Churchill Rivers. Most rivers in Manitoba eventually flow north and empty into Hudson's Bay. Most of Manitoba's inhabited south, near or in Winnipeg, lies within the prehistoric bed of Lake Agassiz, an immense lake located in the center of North America about 13,000 years ago. Fed by glacial runoff at the end of the last ice age, its area was larger than all of the present-day Great Lakes combined. This south-central part of the province is flat with few hills. However, there are many hilly and rocky areas in the province, along with many large sand ridges left behind by glaciers. Baldy Mountain is the highest point at 2,727 feet (832 m) above sea level, and the Hudson Bay coast is the lowest at sea level. Other upland areas include Riding Mountain, the Pembina Hills, Sandilands Provincial Forest, and the Canadian Shield regions. The Canadian Shield— also called the Laurentian Plateau—is a massive geological shield covered by a thin layer of soil that forms the nucleus of the North American or Laurentian craton. It has a deep, common, joined bedrock region in eastern and central Canada and stretches north from the Great Lakes to the Arctic Ocean, covering over half of Canada. (A craton is an old and stable part of the continental crust that has survived the merging and splitting of continents and supercontinents for at least 500 million years. Much of the province's sparsely inhabited north and east lie within the irregular granite landscape of the Canadian Shield, including Whiteshell Provincial Park, Atikaki Provincial Park, and Nopiming Provincial Park. Birds Hill Provincial Park was originally an island in Lake Agassiz after the melting of glaciers. The eastern, southeastern, and northern reaches of the province range through coniferous forests, muskeg, Canadian Shield, and up to tundra in the far north. Forests make up about 263,000 square kilometers of the province's 548,000-square-kilometer land base. The forests generally consist of pines (jackpine, red pine), spruces (white, black), larch, poplars (trembling aspen, balsam poplar), birch trees (white, swamp), and small pockets of Eastern White Cedar. The great expanses of intact forested areas are considered by many naturalists and sportsmen as pristine wilderness areas. Some of the last largest and intact boreal forest of the world can be found along the east side of Lake Winnipeg, with only winter roads, no hydro development, and few largely populated communities. There are many clean and untouched east side rivers that originate in the Canadian Shield and flow west into Lake Winnipeg. The Spirit Sands desert in Spruce Woods Provincial Park. Due to its location in the center of the North American continent, Manitoba has a very extreme climate. In general, temperatures and precipitation decrease from south to north and precipitation also increases from west to east. As Manitoba is far removed from the moderating influences of both mountain ranges and large bodies of water (all of Manitoba's very large lakes freeze during the winter months), and because of the generally flat landscape in many areas, it is exposed to numerous weather systems throughout the year, including prolonged cold spells in the winter months when Arctic high pressure air masses settle over the province. There are three main climate regions. 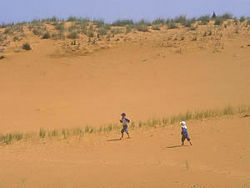 The extreme southwestern corner has a semi-arid mid-latitude steppe climate. This region is somewhat drier than other parts of southern Manitoba and very drought-prone. It is very cold and windy in the winter and also the region most prone to blizzards due to the openness of the landscape. Summers are generally warm to hot, with low to moderate humidity. The remainder of southern Manitoba, including Winnipeg, falls in the humid continental climate zone. Temperatures here are very similar to the semi-arid climate zone, but this region is the most humid area in the Prairie Provinces with moderate precipitation. The central and northern parts of the province—the majority of Manitoba's land area—falls in the subarctic climate zone. This region features long and extremely cold winters and brief, mild summers, with relatively little precipitation. This has resulted in the capital of the province being nicknamed "Winterpeg." It is common to have overnight lows below -40°F (-40°C) several days each winter across the province (quite frequent in the north), and to have a few weeks that remain below 0°F (-18°C). In the summer months the climate is often influenced by low pressure air masses originating in the Gulf of Mexico, resulting in hot and humid conditions and frequent thunderstorms with a few tornadoes each year, along with temperatures exceeding 90°F (32°C) several times each summer. Petroforms are human-made shapes and patterns of rocks on the open ground. This ancient system was used by indigenous peoples for astronomical, religious, sacred, healing, mnemonic devices, and teaching purposes. This photo was taken in 2007 in Whiteshell Provincial Park, Manitoba, Canada. The geographical area now named Manitoba was originally inhabited as soon as the last ice age glaciers retreated in the southwest. The first exposed land was the Turtle Mountain area, where large numbers of petroforms and medicine wheels can be found. The first humans in southern Manitoba left behind pottery shards, spear and arrow heads, copper, petroforms, pictographs, fish and animal bones, and signs of agriculture along the Red River near Lockport. Eventually there were the aboriginal settlements of Ojibwa, Cree, Dene, Sioux, Mandan, and Assiniboine peoples, along with other tribes that entered the area to trade. There were many land trails made as a part of a larger native trading network on both land and water. The Whiteshell Provincial Park region along the Winnipeg River has many old petroforms and may have been a trading center or even a place of learning and sharing of knowledge for over 2,000 years. The cowry shells and copper are proof of what was traded as part of a large trading network to the oceans and to the larger southern native civilizations along the Mississippi River and in the south and southwest. In northern Manitoba there are areas that were mined for quartz to make arrow heads. Henry Hudson was one of the first Europeans to sail into what is now known as Hudson Bay. He is presumed to have died in 1611 in Hudson Bay after he was set adrift with his son and seven others by his crewmen, following a mutiny. The first European to reach present-day central and southern Manitoba was Sir Thomas Button, who traveled upstream along the Nelson River and Lake Winnipeg in 1612. The expedition he commanded unsuccessfully attempted to locate Hudson and navigate the Northwest Passage. He is credited with exploring and securing the west coast of Hudson Bay for England. The Nonsuch ship that sailed into Hudson Bay in 1668-1669 was the first trading voyage and led to the formation of the Hudson's Bay Company. The company was given the fur trading rights to the entire Hudson's Bay watershed, which covers land in what is now known as Alberta, Saskatchewan, Manitoba, Ontario, Minnesota, North Dakota, and more. This watershed was named Rupert's Land, after Prince Rupert, who helped to form the Hudson's Bay Company. Other traders and explorers eventually came to Hudson's Bay shores and went south along many northern Manitoba rivers. Pierre Gaultier de Varennes, Sieur de la Vérendrye, visited the Red River Valley in the 1730s as part of opening the area for French exploration and exploitation. Many other French and Metis explorers came from the east and the south by going down the Winnipeg and Red Rivers. A French-Canadian population still lives in Manitoba, especially in eastern Winnipeg. 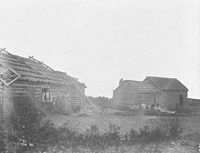 Fur trading forts were built by both the NorthWest Company and the Hudson's Bay Company along the many rivers and lakes, and there was often fierce competition with each other in more southern areas. The territory was won by Great Britain in 1763 as part of the French and Indian War, and became part of Rupert's Land, the immense trading monopoly territory of the Hudson's Bay Company. The founding of the first agricultural community and settlements in 1812 by Lord Selkirk, north of the area which is now downtown Winnipeg, resulted in conflict between the British colonists and the Métis (an ethnic group of mixed Native American, French Canadian, Scottish, and English descent) who lived and traded near there. Twenty colonists, including the governor, were killed by the Métis in the Battle of Seven Oaks in 1816, in which the settlers fired the first shots. One Metis man was killed. Many fur trading forts were attacked by each side over the years. 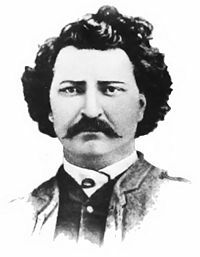 When Rupert's Land was ceded to Canada in 1869 and incorporated into the Northwest Territories, a lack of attention to Métis concerns led their elected leader Louis Riel to establish a provisional government as part of the Red River Rebellion. Negotiations between the provisional government and the Canadian government resulted in the creation of the Province of Manitoba and its entry into Confederation in 1870. The Métis were blocked by the Canadian government in their attempts to obtain land promised to them as part of Manitoba's entry into confederation. Facing racism from the new flood of white settlers from Ontario, they moved in large numbers to what would become Saskatchewan and Alberta. Originally, the province of Manitoba was only 1/18th of its current size, and square in shape; it was known as the "postage stamp province." It grew progressively, absorbing land from the Northwest Territories until it attained its current size by reaching 60°N in 1912. Treaties were signed in the late 1800s with the chiefs of various First Nations that lived in the area now known as Manitoba. These treaties made quite specific promises of land for every family, medicine chests, yearly payments, and so on. This led to a reserve system under the jurisdiction of the federal government. Presently, there are still land claim issues because the proper amount of land that was promised to the native peoples was not given in all cases. The Manitoba Schools Question showed the deep divergence of cultural values in the territory. The French had been guaranteed a state-supported separate school system in the original constitution of Manitoba, but a grassroots political movement among Protestants in 1888-1890 demanded the end of French schools. In 1890, the Manitoba legislature passed a law abolishing French as an official language of the province and removing funding for Catholic schools. The French Catholic minority asked the federal government for support; however the Orange Order and other anti-Catholic forces mobilized nationwide. The Conservatives proposed remedial legislation to override Manitoba's legislation, but they in turn were blocked by Liberals, led by Wilfrid Laurier, who opposed the remedial legislation on the basis of provincial rights. Once elected prime minister in 1896, Laurier proposed a compromise stating that Catholics in Manitoba could have a Catholic education for 30 minutes at the end of the day if there were enough students to warrant it, on a school-by-school basis. Tensions over language remained high in Manitoba (and nationwide) for decades to come. Crowd gathers outside old City Hall during the Winnipeg general strike in 1919. Winnipeg was the fourth largest city in Canada by the early 1900s. A boom town, it grew quickly from the late 1800s to the early 1900s. There were a lot of outside investors, immigrants, and railways. Business was booming. Even today, one can see the many old mansions and estates that belonged to Winnipeg's ever-growing wealthy class. When the Manitoba Legislature was built, it was expected that Manitoba would have a population of three million quite soon. Around the time of World War I, the city's growth began to cool as investment lagged. Winnipeg eventually fell behind in growth when other major cities in Canada began to boom, such as Calgary. In the 1917 election, in the midst of a conscription crisis, the Liberals were split in half and the new Union party carried all but one seat. As the war ended, severe discontent among farmers (over wheat prices) and union members (over wage rates) resulted in an upsurge of radicalism. With Bolshevism coming to power in Russia, conservatives were anxious and radicals were energized. 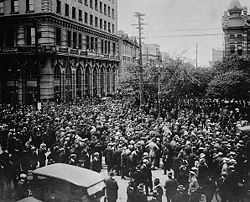 The most dramatic episode was the Winnipeg general strike of 1919, which shut down most activity for six weeks. In the aftermath eight leaders went on trial, and most were convicted on charges of seditious conspiracy, illegal combinations, and seditious libel; four were aliens who were deported under the Immigration Act. Labor was weakened and divided as a result. Farmers, meanwhile, were patiently organizing the United Farmers of Manitoba, with plans to contest the 1920 provincial elections. The result was that no party held a majority. The Farmers, running against politics-as-usual, won in 1922. 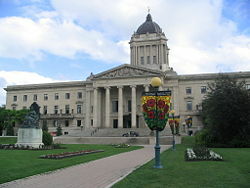 Manitoba is governed by a unicameral legislature, the Legislative Assembly of Manitoba, which operates under the Westminster system of government. The executive branch is formed by the majority party, and the party leader is the premier of Manitoba, the head of government. The head of state is represented by the lieutenant governor of Manitoba, who is appointed by the governor general of Canada on advice of the prime minister. The head of state is mainly a ceremonial and figurative role today. The legislative arm consists of 57 members. Manitoba's primary political parties are the New Democratic Party of Manitoba, the Progressive Conservative Party of Manitoba, and the Liberal Party of Manitoba. The Legislative Assembly of Manitoba was established on July 14, 1870. Originally, it was named a Parliament and was later renamed a legislature. Manitoba attained full-fledged rights and responsibilities of self-government as the first Canadian province carved out of the Northwest Territories, control over which had been passed by Great Britain to the government of Canada in 1869 because of the sale of Rupert's Land by the Hudson's Bay Company. The creation of Manitoba out of the Northwest Territories was unusually quick. Saskatchewan and Alberta, in contrast, went through a long period of apprenticeship as part of the Northwest Territories until they became provinces in 1905. Louis Riel first introduced the subject of provincial status to the Committee of Forty appointed by the citizens of Red River in 1870. Riel's proposal to Donald Smith, emissary for the government of Canada, was rejected by the government of John A. Macdonald. But the list of demands from Riel did goad the government of Canada to act on a proposal of its own regarding Red River's status. Macdonald introduced the Manitoba Act in the Canadian House of Commons and pretended that the question of province or territory was of no significance. The bill was given royal assent and Manitoba joined Canada as a province. However, with the rise to power of the English-only movement in Manitoba from 1890 onward, this provision was disregarded in practice and by Manitoban legislation. In April 1890, the Manitoba legislature introduced a measure to abolish the official status of French in the legislature, the laws, records and journals, as well as the courts of Manitoba. Among other things, the legislature ceased to publish legislation in French. However, in 1985 the Supreme Court of Canada ruled that publishing legislation only in English was invalid. Although French is required to be an official language for the purposes of the legislature, legislation, and the courts, the Manitoba Act (as interpreted by the Supreme Court of Canada) does not require it to be an official language for the purpose of the executive branch of government (except when the executive branch is performing legislative or judicial functions). Hence, Manitoba's government is not completely bilingual; the only bilingual province is New Brunswick. The Manitoba French-language Services Policy of 1999 is intended to provide a comparable level of provincial government services in both official languages. Services to the public, including public utilities and health services, official documents such as parking tickets and court summonses, court and commission hearings, and government web sites are accessible in both English and French. Downtown Winnipeg seen from The Forks. Manitoba is one of Canada's most ethnically diverse provinces. More than 115,000 people of Aboriginal origin live there, along with one of the most sizable populations of Mennonites in the world. The city of St. Boniface boasts the largest population of Francophone Canadians outside Quebec, and Manitoba is an important center of Ukrainian culture in Canada. The Gimli area is home to the largest community of Icelandic people outside Iceland. According to the 2001 Canadian census, the largest ethnic group in Manitoba is English (22.1 percent), followed by German (18.2 percent), Scottish (17.7 percent), Ukrainian (14.3 percent), Irish (13.0 percent), French (12.6 percent), First Nations (9.9 percent), Polish (6.7 percent), Métis (5.2 percent), and Dutch (4.7 percent), although almost a quarter of all respondents also identified their ethnicity as "Canadian." In the 1870s, German-speaking Mennonites from Europe and Russia settled in southern Manitoba. By 1880, about 7,000 Mennonites had arrived, and during the First and Second World Wars, more pacifist Mennonites and Hutterites came. Today, southern Manitoba is sprinkled with Mennonite towns and villages, as well as Hutterite colonies. During the late nineteenth and early twentieth centuries, huge numbers of Russians, Poles, Estonians, Scandinavians, Icelanders, and Hungarians immigrated to Canada's Prairies, the largest group being the Ukrainians. In more recent years, other Europeans and those of Asian, Latin American, and Arab ancestry have joined the mix. In a study of the languages first learned and still understood, 823,910 cited English and 44,335 French. Manitoba's early economy was one that depended on mobility and living off the land. A number of Aboriginal Nations, including the Cree, Ojibwa, Dene, Sioux, and Assiniboine, followed herds of bison and congregated to trade among themselves at key meeting places throughout the province. The first fur traders entering the province in the seventeenth century changed the dynamics of the economy of Manitoba forever. For the first time, permanent settlements of forts were created and communities evolved over time. Most of the trade centered around the trade in pelts of beavers and other animals. Many native scouts and native maps were used to help the fur traders make their way through the region. Some of the best first maps were made with the help of natives who knew the river routes within their traditional home territories. The natural rivers, creeks, and lakes were the most important routes for trade and travel. The first major diversification of the economy came when Lord Selkirk brought the first agricultural settlers to an area just north of present-day Winnipeg in 1811. The lack of reliable transportation and an ongoing dispute between the Hudson's Bay Company, the North West Company and the Métis impeded growth. The eventual triumph of the Hudson's Bay Company over its competitors ensured the primacy of the fur trade over widespread agricultural colonization. Any trade not sanctioned by the HBC was frowned upon. It took many years for the Red River Colony to develop under HBC rule. The company invested little in infrastructure for the community. It was only when independent traders started competing in trade that improvements to the community began to happen. By 1849, the HBC faced even greater threats to its monopoly. A Métis fur trader named Pierre Guillaume Sayer was charged with illegal trade by the Hudson Bay Company. Sayer had been trading with Norman Kittson, who resided just beyond the HBC's reach in Pembina, North Dakota. The court found Sayer guilty but the judge levied no fine or punishment. In 1853, a second agricultural community started in Portage la Prairie. The courts could no longer be used by the HBC to enforce its monopoly. The result was a weakening of HBC rule over the region and laid the foundations of provincehood for Manitoba. Manitoba's economy relies heavily on tourism, energy, agriculture, oil, minerals, mining, forestry, and transportation. Around 12 percent of Canadian farmland is in Manitoba. Though agriculture is vital to Manitoba's economy, it is only found only in the southern half of the province, although some grain farming is found as far north as The Pas. The most common type is cattle farming (34.6 percent), followed by other grains (19.0 percent) and oilseed (7.9 percent). Manitoba is the nation's largest producer of sunflower seed and dry beans and one of the leading potato producers. Portage la Prairie is the North American potato processing capital. It is home to the McCain Foods and Simplot potato processing plants, which provide french fries for McDonalds, Wendy's, and various other commercialized restaurant chains. Can-Oat milling, one of the largest oat mills in the world, is also located in the municipality. Manitoba is the only Canadian province with an Arctic deep water sea port, located in Churchill, along Hudson Bay. Manitoba's sea port is the only link along the shortest shipping route between North America, Europe, and Asia. Churchill's arctic wildlife plays an important part in Manitoba's tourism industry, having acquired the nicknames of "Polar bear capital of the world" and "Beluga capital of the world." The Arctic Bridge shipping route may be able to link North America to markets in Europe and Asia using ice-free routes across the Arctic Ocean. 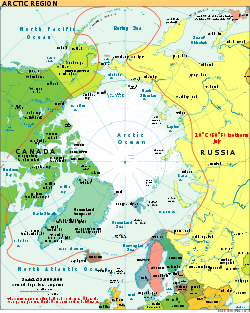 The Arctic Sea Bridge is a potential sea route linking Russia to Canada, specifically the Russian port of Murmansk to the Hudson Bay port of Churchill. It is not an actual bridge, but a shipping route that would affect the nations with lands near the Arctic Circle. The concept has long been a priority for the government of Manitoba, which sees vast potential as the northern hub of a mid-continent trade corridor that would extend to the Gulf of Mexico. Many view the creation of such a route as a crucial link between Eurasia and North America with the potential to change the face of business. Research has indicated that Churchill offers the most cost-effective and time-efficient route for transportation of goods between central North America and Northern Europe. On February 15, 2002, Manitoba Premier Gary Doer signed a letter of intent to move toward development of the arctic bridge. Doer was joined at the signing ceremony by Russian officials, who have shown a keen interest in developing such a shipping route, which may be facilitated by the retreat of Arctic ice. On October 17, 2007, the Kapitan Sviridov docked in Churchill after having sailed from Estonia loaded with bags of fertilizer destined for sale to North American farmers. It was the first time the port had accepted imports from Russia and was hailed as an historic step. Transportation and warehousing contributes approximately $2.2 billion to Manitoba’s GDP. Total employment in the industry is estimated at 34,500. Manitoba has a rail, air, road, and marine component to its transportation industry. The Trans-Canada Highway, built between 1950 and 1971, crosses the province from east to west. Trucks haul 95 percent of all land freight in Manitoba, and trucking companies account for 80 percent of Manitoba's merchandise trade to the United States. Five of Canada's twenty-five largest employers in for-hire trucking are headquartered in Manitoba, and three of Canada's 10 largest employers in the for-hire trucking industry are headquartered in Winnipeg. Some $1.18 billion of Manitoba's GDP directly or indirectly comes from trucking. Around 5 percent or 33,000 people work in the trucking industry. Manitoba has two Class I railways. They are CN and Canadian Pacific Railway. Winnipeg is centrally located on the main lines of both of these continental carriers, and both companies maintain large terminals in the city. CN and CP operate a combined 2,439 kilometers of track within Manitoba. The first railway through Manitoba was the CP Railway, and the tracks were diverted south to make Winnipeg the capital and center, rather than Selkirk, which is located farther north. Winnipeg James Armstrong Richardson International Airport is one of only a few 24-hour, unrestricted airports in Canada, and is part of the National Airports System. It has a broad range of air passenger and cargo services and served over 3 million in 2003. The airport handles approximately 140,000 tons of cargo annually. A new airport terminal building is scheduled to be completed in 2009. The Port of Churchill, owned by OmniTRAX, is Manitoba's window to the Arctic and to the sea. The port of Churchill is nautically closer to ports in Europe than many other ports in Canada. It has four deep-sea berths for the loading and unloading of grain, general cargo, and tanker vessels. Grain represented 90 percent of the port’s traffic in the 2004 shipping season, when over 600,000 tons of agricultural product was shipped through the port. 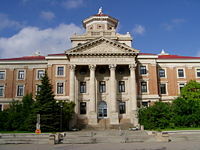 The University of Manitoba has the largest enrollment in Manitoba. Manitoba's school system is comprised of public schools, independent schools that receive provincial funding, non-funded independent schools, and home schooled students. Public schools are governed by locally elected school division/district boards and are funded by a combination of direct provincial funding and special taxation levies. Some independent schools are affiliated with a specific religious or denominational group. They are eligible for provincial funding if they implement the Manitoba curriculum and meet a number of additional requirements. Non-funded independent schools may not follow provincial curricula but must meet an equivalent standard. The province has two colleges (Assiniboine Community College and Red River College) and five universities: Brandon University, Canadian Mennonite University, University of Manitoba, Saint Boniface, and the University of Winnipeg. The capital city, Winnipeg, offer world-class music, dance, theater, and museums. The Winnipeg Symphony Orchestra offers a unique Indigenous and an edgy Contemporary Festival. Manitoba Opera, the Manitoba Chamber Orchestra, Jazz Winnipeg, Groundswell, the Philharmonic Choir and the Folk Festival also present music. There are over a dozen theater companies. The Royal Winnipeg Ballet and the Winnipeg Contemporary Dancers offer a choice of dance. Manitoba continued to perform well despite the global economic downturn or the early twentieth century. It posted stronger economic growth in 2008 than most Canadian provinces. Manitoba’s gross domestic product outpaced the Canadian average by a rate 3.3 percent in 2007. Manitoba offers lower operating costs, a skilled multilingual workforce, abundant clean reliable electrical energy, and excellent research and communication facilities. It has a world-class sophisticated telecommunications and information technology infrastructure. Winnipeg is ranked as the third lowest cost of living city in the North American Midwest. The province also posted the country’s second best job-growth rate and one of the lowest unemployment rates at 3.9 percent in 2008. It is well situated in the center of the nation and is the only Canadian province with an Arctic deep water sea port, located in Churchill, on Hudson Bay. Manitoba's sea port is the country's only link along the shortest shipping route between North America, Europe, and Asia. Since 1990, Manitoba's exports more than doubled. The emphasis in coming years will be on making the province more competitive, expanding into new international markets such as the European Union, China, India, and Brazil), and investing in skills development, aboriginal education, and addressing the needs of the new economy. Business Week magazine placed Premier Gary Doer in the list of the top 20 international leaders who are combating climate change. The magazine also ranked Manitoba as the number one regional government in the world in this effort. ↑ Statistics Canada, Population by selected ethnic origins, by province and territory (2001 Census) (Manitoba). Retrieved January 19, 2009. ↑ Statistics Canada, 2001 Community Profiles. Retrieved January 19, 2009. ↑ 3.0 3.1 3.2 Statistics Canada, Farms, by farm type and province (Census of Agriculture, 2001 and 2006) (Manitoba). Retrieved January 19, 2009. ↑ Joe Friesen, October 18, 2007, Russian ship crosses "Arctic bridge" to Manitoba, Globe and Mail. Retrieved January 10, 2009. ↑ Government of Manitoba, Transportation & Logistics. Retrieved January 19, 2009. ↑ Jordan Timm, May 31, 2007, Canada's most successful provincial politician on going green, the future of the NDP and why he likes Stephen Harper, Macleans Canada. Retrieved January 19, 2009. Carr, Ian, and Robert E. Bearmish. 1999. Medicine Manitoba: A Brief History. Winnipeg: Univ. of Manitoba Press. ISBN 0887556604. Chafe, J. W. 1973. Extraordinary Tales from Manitoba History. Toronto: Published under the auspices of the Manitoba Historical Society in association with McClelland and Stewart Limited. ISBN 9780771019517. Clark, Lovell. 1968. The Manitoba School Question: Majority Rule or Minority Rights? Issues in Canadian history. Toronto: Copp Clark. OCLC 464353. Cook, Ramsay. 1963. The Politics of John W. Dafoe and the Free Press. Toronto: University Press. Retrieved January 19, 2009. Dafoe, John W. 1931. Clifford Sifton in Relation to his Times. Toronto: Macmillan. Retrieved January 19, 2009. Donnelly, Murray S. 1963. The Government of Manitoba. Toronto: Univ. of Toronto Press. Retrieved January 19, 2009. Ellis, Joseph Henry. 1970. The Ministry of Agriculture in Manitoba, 1870-1970. Winnipeg: Manitoba Dept. of Agriculture Economics and Publications Branch. OCLC 801115. Ewanchuk, Michael. 1981. Pioneer Profiles: Ukrainian Settlers in Manitoba. Winnipeg: M. Ewanchuk. ISBN 0969076843. Friesen, Gerald, and Barry Potyondi. 1981. A Guide to the Study of Manitoba Local History. Manitoba: Published by the University of Manitoba Press for the Manitoba Historical Society. ISBN 9780887556050. Hebert, Raymond M. 2004. Manitoba's French-Language Crisis: A Cautionary Tale. McGill-Queen's University Press, ISBN 0773527907. Kinnear, Mary. 1987. First Days, Fighting Days: Women in Manitoba History. Canadian plains proceedings, 18. Regina, Sask: Canadian Plains Research Center, University of Regina. ISBN 9780889770478. Morton, W.L. 1970. Manitoba: A History. Toronto: University of Toronto Press. ISBN 0802060706. Retrieved January 19, 2009. Petryshyn, Jaroslav, and L. Dzubak. 1985. Peasants in the Promised Land: Canada and the Ukrainians, 1891-1914. Toronto: J. Lorimer. ISBN 9780888629258. Whitcomb, Edward A. 1982. A Short History of Manitoba. Stittsville, ON: Canada's Wings. ISBN 0920002153. Yuzyk, Paul. 1953. The Ukrainians in Manitoba; a Social History. [Toronto]: University of Toronto Press. OCLC 1014225. This page was last modified on 10 August 2018, at 18:31.